Kale is a superfood, right? That’s what people have been saying for ages. It’s rich in anti-oxidants, with an ORAC rating of 1770 (I don’t really know what that means but it sound good, doesn’t it?) It’s high in iron, has anti-cancer properties, it’s anti-inflammatory and on and on. Of course, there’s now a kale backlash. It was almost bound to happen. We build a vegetable up just to knock it down… They (the invisible ‘them’) now say that other foods are better for you than kale. Lettuce is the new kale, it seems, but, whilst we love a crispy green, we’re not falling for this. Kale is food. Kale tastes super. Ergo kale is a superfood. OK? 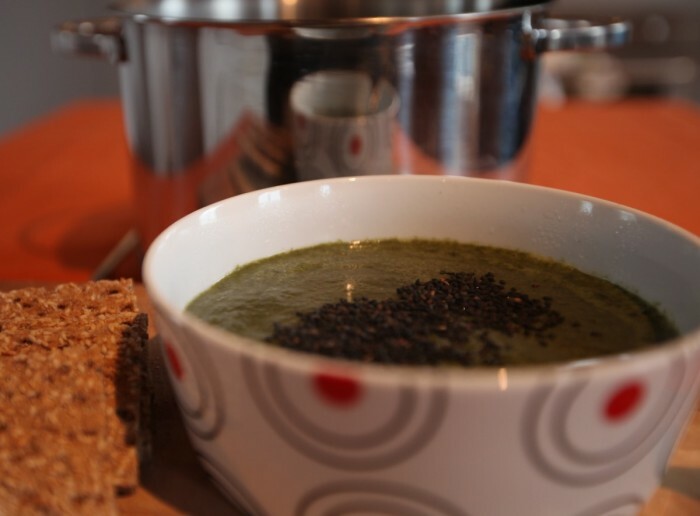 This tasty Kale and Sesame Soup makes a delicious lunch or supper and, as ever, it’s really easy to make. It adds black beans for deep flavour and plenty of protein and sesame seeds for a lovely nutty taste and crunchy garnish. I used black sesame seeds, mainly because I’m a nerdy food head, but white ones will taste just as good. 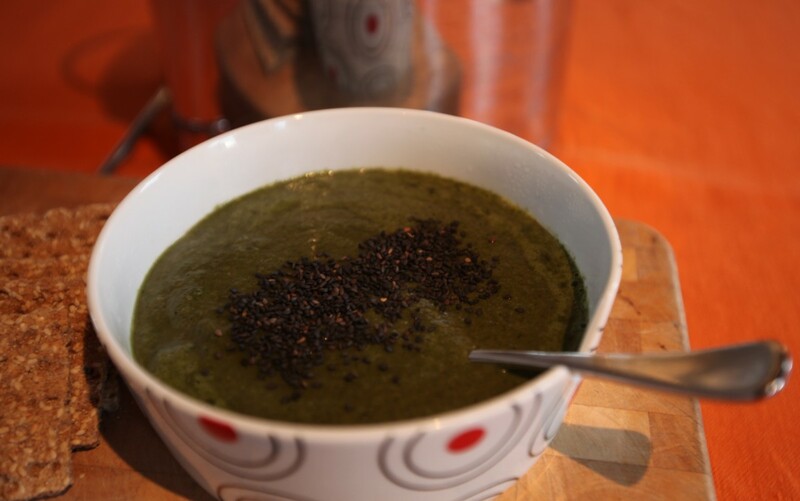 My marvellous Froothie blender buzzed this up in a heartbeat (though a stick blender would do the job too, just slower). Heat the oil and saute the onions and garlic for 5 minutes until they start to soften. Add 2 of the tablespoons of sesame seeds and cook for 1 minute, stirring constantly. Add the kale and mix well until it is well coated with the oil. Cook on a low to medium heat for 5 minutes until it starts to wilt slightly. Add all of the other ingredients, raise the heat slightly and cook for about 10 minutes until the kale is cooked through. Buzz in a food processor or with a stick blender. Toast the last tablespoon of sesame seeds in a dry pan to use as a (very delicious) garnish. However, she does love kale, so I’ll give this a whirl! Hi. 🙂 Just to confirm, when you write 400g beans, that’s the drained weight? (The tins in my shop say 400g, but the drained weight is only 240g, so I would need more than one tin.) Thank you!